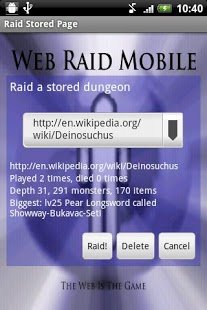 Web Raid is a unique dungeon crawler: It turns web pages into dungeons. Everything (really everything up to the placement of every single stone) that you see in the dungeon reflects a web page’s sentences. Words are turned into monsters and into the items to fight them. The power and capabilities of monsters and items depend entirely on the word (e.g. “semispherical” turns into a level 13 Black Jaguar and “antidisestablishmentarianism” into a level 36 Tarn dragon that’s almost impossible to kill). Also, every consonant and vowel in the word plays a role in abilities and character of the monster, or the weight and quality of an item. 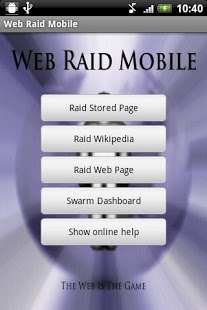 Web Raid uses the social platform “Swarm” for leaderboards and achievements. Swarm requires some permissions that may seem intrusive. The game’s web page lists and explains them all. Your goal is to descend into a dungeon of your choice, collect what you can find, kill bad beasts, and return back to the surface to claim the memories of having done so. To succeed you need to carefully select the most fitting armor, weaponry, and magic amulets, utilize your 5 blocks well, and create magic grease to enhance your stuff. With the help of Swarm’s social capabilities, Web Raid features 3 leaderboards and 48 achievements to unlock. Web Raid Mobile is turn based and doesn’t currently feature much animation or sound. The game comes in two flavors: a free version and a pro version. You get the pro version by buying the “Androidicus Token” in the Market (a menu in the game takes you there). New features typically make it into the pro version first. Users of the free version need to wait a few months. – As many different dungeons as there are (English) web pages, meaning: a lot of them. – Monsters may pick up stuff, wield weapons, wear armor. Some will follow you, some will act in teams, some will run away or mind their own business. – Weapons to wield, bows to shoot, armor to wear, magical amulets to speed you up and slow down monsters, spellbooks to read, treasures to collect. – Armor can be cleverly combined for more protection. – Every monster and you have an individual weight and speed. Wear the right magical amulets to reduce your weight and increase theirs, and get an advantage in combat. – Five different dungeon styles (mazes, caves, ruins, houses, nethack-style rooms with corridors), 10 different dungeon themes. – Place blocks or dig holes to get an “unfair advantage” in levels where there’s no way out. – UI supports swiping, pinching (on devices running Android 2.2 or later), short tapping, long tapping, double tapping gestures for easy, fast, convenient gaming. – Memories telling you exactly what you’ve been able to get out of your dungeons. – Game progress system giving you a lot to reach. – 3 global leaderboards, 48 achievements. – Six magic spells that allow you to manipulate the elements of everything in the dungeon. Please note that the very nature of the game means that some dungeons are tough while others are easy. Doing more sophisticated balancing would mean not generating everything from the web page. Also note: the game still is not able to save your progress in a dungeon. I personally didn’t find that very annoying; still: apologies for any inconvenience this causes. – bugfixes and significant enhancements of recommendations in “remove trash” menu. – Remembers the zoom level you have adjusted.